Since last analysis price has moved sideways to complete a small green candlestick for Thursday’s session (I had expected a red candlestick). 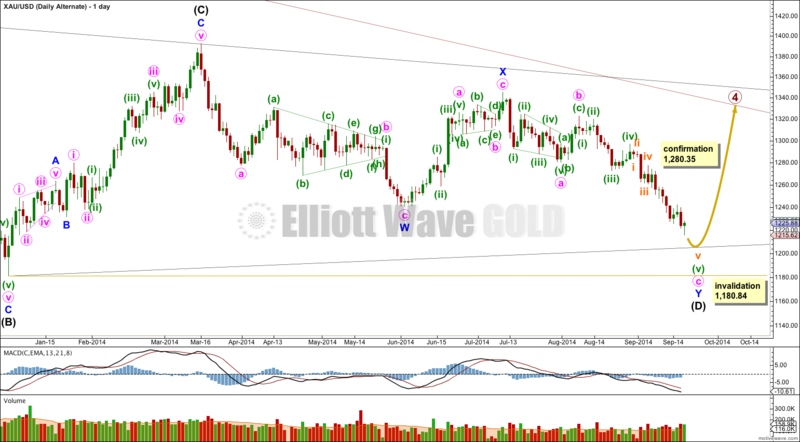 The Elliott wave count remains mostly the same and the target is now calculated at three wave degrees. Summary: The structure is incomplete. I expect more downwards movement. The new target for it to end is 1,211 to 1,206 and should be met in 24 hours. Extend the triangle trend lines of primary wave 4 outwards. The point in time at which they cross over may be the point in time at which primary wave 5 ends. This does not always work, but it works often enough to look out for. It is a rough guideline only and not definitive. A trend line placed from the end of primary wave 4 to the target of primary wave 5 at this point in time shows primary wave 5 would take a total 26 weeks to reach that point, and that is what I will expect. Primary wave 4 has just begun its 10th week. The black (B)-(D) trend line is clearly breached. I have confidence that primary wave 5 has begun. The black (B)-(D) trend line is now also clearly breached on the weekly chart. This is significant. However, when triangles take their time and move close to the apex of the triangle, as primary wave 4 has (looking at this on a weekly chart is clearer) the movement following the triangle is often shorter and weaker than expected. If the target at 956.97 is wrong it may be too low. In the first instance I expect it is extremely likely that primary wave 5 will move at least below the end of primary wave 3 at 1,180.40 to avoid a truncation. When intermediate waves (1) through to (4) within primary wave 5 are complete I will recalculate the target at intermediate degree because this would have a higher accuracy. I cannot do that yet; I can only calculate it at primary degree. Minor wave 3 has now passed 1.618 the length of minor wave 1. If minor wave 3 ends within the new target zone it may still exhibit an adequate Fibonacci ratio of 1.618 the length of minor wave 1. I consider any variation less than 10% to be adequate. Movement comfortably below 1,180.84 would invalidate the alternate daily wave count below and provide further confidence in this main wave count. When minor wave 3 is over (I expect this to be over within 24 hours, before next analysis) I will draw a Fibonacci retracement along its entire length and expect minor wave 4 to correct up to the 0.236 or 0.382 Fibonacci ratio, so that there is alternation with the deep correction of minor wave 2. I expect this tendency to alternation may be stronger than a tendency for corrections following fifth wave extensions to reach up to the end of the second wave within the extended fifth wave. Subminuette wave v is still incomplete, must subdivide as a five wave structure, and is unfolding as an impulse. I have adjusted the analysis of micro wave 2 within it because sideways movement for Thursday looks so clear as its counterpart fourth wave correction. This expects just one final short push down for micro wave 5 to complete the entire structure of minor wave 3 at all wave degrees. There is no Fibonacci ratio between micro waves 1 and 3. It is more likely we shall see a Fibonacci ratio between micro wave 5 and either of 3 or 1. At 1,211 micro wave 5 would reach 1.618 the length of micro wave 1. At 1,210 subminuette wave v would reach 1.618 the length of subminuette wave i. Because there is no adequate Fibonacci ratio between subminuette waves iii and i I would expect it is very likely we shall see a Fibonacci ratio for subminuette wave v to either of i or iii. 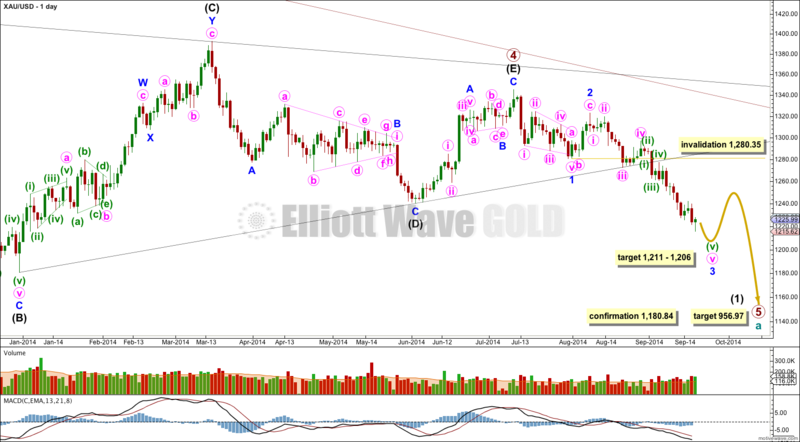 At 1,206 minuette wave (v) would reach 1.618 the length of minuette wave (iii). There is no adequate Fibonacci ratio between minuette waves (i) and (iii) so I would again expect it is very likely we shall see a Fibonacci ratio between minuette wave (v) and either of (i) or (iii). This gives a $5 target zone calculated at three wave degrees. The upper edge of the zone is calculated at the lowest wave degree, and the lower edge of the zone is calculated at the highest wave degree. I favour the upper edge of the zone for this reason. Draw a channel about minuette wave (v) using Elliott’s second technique: draw the first trend line from the highs of subminuette waves ii to iv, then place a parallel copy on the low of subminuette wave iii. Look for the downwards edge of this channel to provide support. This may be where this downwards movement for minor wave 3 ends. When subminuette wave v may be seen as a completed five wave impulse then subsequent movement above 1,234.74 would provide price confirmation that minor wave 3 in its entirety is over. At that stage also movement above the upper edge of the channel would provide trend channel confirmation of a trend change at minor degree also. I would judge this wave count to have a very low probability only because of proportion between primary waves 2 and 4. The main wave count sees them almost exactly of the same duration, with primary wave 2 lasting 53 weeks and primary wave 4 lasting 54 weeks. This alternate would see primary wave 4 as much longer in duration than primary wave 2. It is the proportion between second and fourth waves within an impulse which gives the wave count what is called the “right look”. This alternate would still have the right look, but it would not look as good as the main wave count. 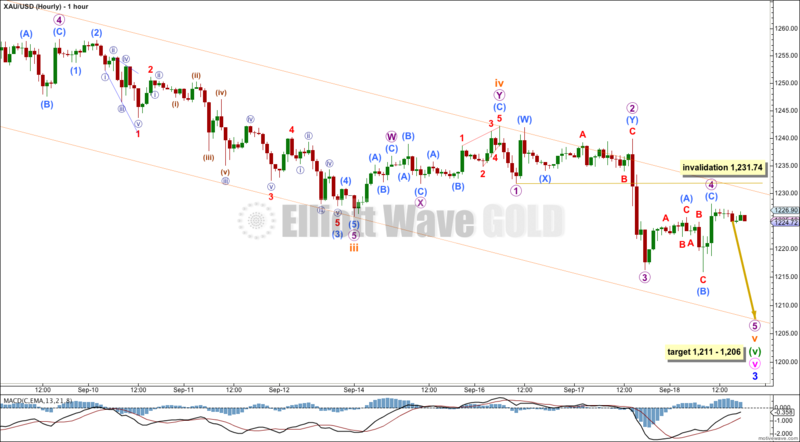 If intermediate wave (D) is continuing it can only be as a double zigzag. For a contracting triangle intermediate wave (D) may not move beyond the end of intermediate wave (B) below 1,180.84. For a barrier triangle intermediate wave (D) should end about the same level as intermediate wave (B), as long as the (B)-(D) trend line is essentially flat. In practice this means that intermediate wave (D) could end slightly below 1,180.84 and the wave count would remain valid. Unfortunately, this invalidation point is not black and white. If intermediate wave (D) is a double zigzag, then intermediate wave (C) must be seen as a single zigzag because only one of the five subwaves of a triangle may be a double. It is possible to see intermediate wave (C) as a zigzag, but to do so a rather obvious triangle must be ignored after the end of minor wave A. The main wave count sees a triangle in that position. I think this reduces the probability of this alternate. Within intermediate wave (C) the subdivision within minuette wave (i) of minute wave iii of minor wave C is problematic. On the hourly chart this upwards wave subdivides as a double zigzag and does not fit well at all as a five wave structure. This is another reason why I would prefer a wave count which sees a triangle in that position because the subdivisions of those waves fit a triangle perfectly. This further reduces the probability of this alternate. This alternate wave count does not diverge from the main wave count at this stage, and will not diverge for another one or two weeks. The main wave count expects downwards movement to complete minor wave 3 and this alternate expects downwards movement to complete minute wave c. Thereafter, the main wave count would expect upwards movement for minor wave 4 and this alternate wave count would expect upwards movement for intermediate wave (E). If at that stage price moves above 1,280.35 for that upwards movement then the main wave count would be invalidated and this alternate confirmed. This analysis is published about 04:29 p.m. EST. Besides the video problems that we were having earlier, recently I’ve been unable to login and I received no e-mails/updates since the 18th despite being paid-up. Sent a note via the contact page earlier too, and would appreciate any help with this glitch, please. Thank you for your ever clearer and better analysis! Please let me just observe 2 things about todays and yesterdays counts: I think the invalidation point (micro wave 1) should be 1231.74. In fact this was the low o my charts and it seems so also on your’s. Second thing is a question: How are you able to see the last minuette (C) as a 5 wave structure? It seems to me somewhat incomplete on the 15min chart. Thank you in advance for your reply. Thanks for pointing that mistake out, I’ve fixed it. You’re right, the invalidation point is 1,231.74. On the five minute chart it could be either. On the one minute chart it could be either, and in fact it could be a complete ending expanding diagonal. Its just unclear. I’ve learned the hard way to allow for both possibilities, and so that is why the invalidation point allows for micro wave 4 to move higher. The downwards sideways movement of the most recent few hours is out of proportion to other corrections along the way up within submicro wave (C) though, so if it is not over when it is done it would look strange.